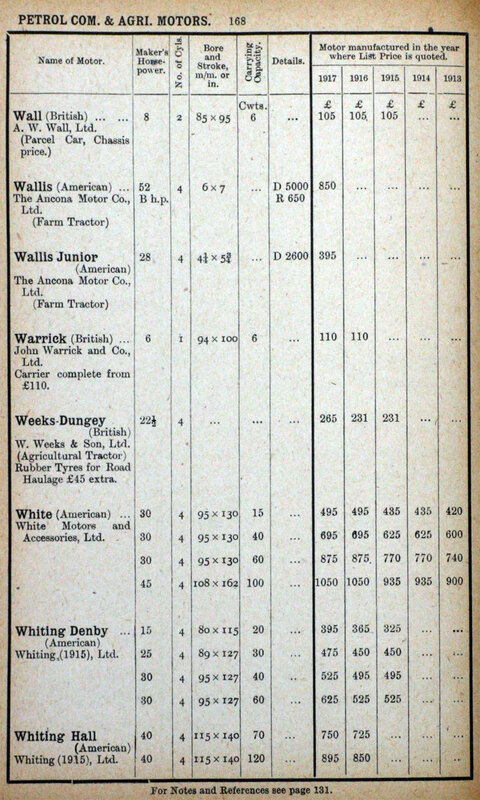 A list of suppliers of Petrol engined Commercial and Agricultural Motor Vehicles available in the UK from 1913 to 1917.
p146. 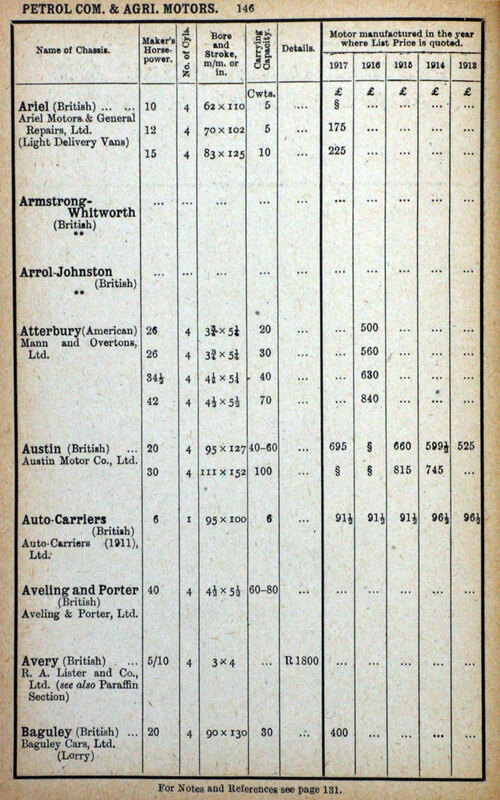 Ariel, Armstrong Whitworth, Atterbury (American), Austin, Auto-Carriers, Aveling and Porter, Avery, Baguley. p147. 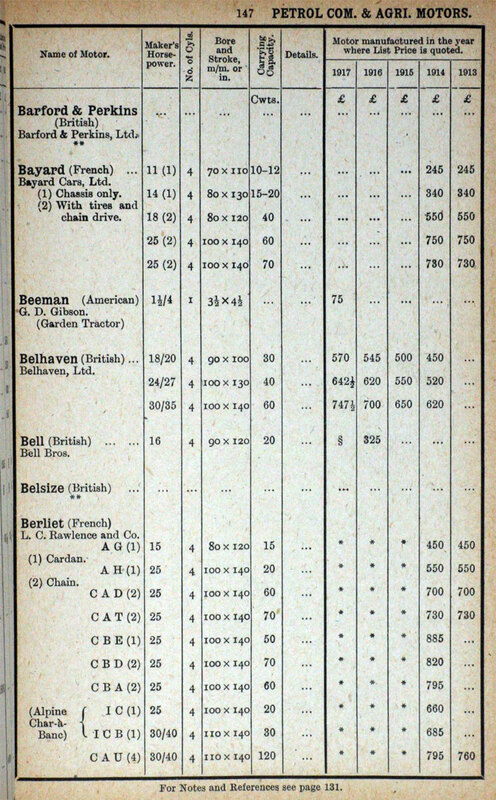 Barford and Perkins, Bayard, Beeman (American), Bell, Belsize, Berliet. p148. 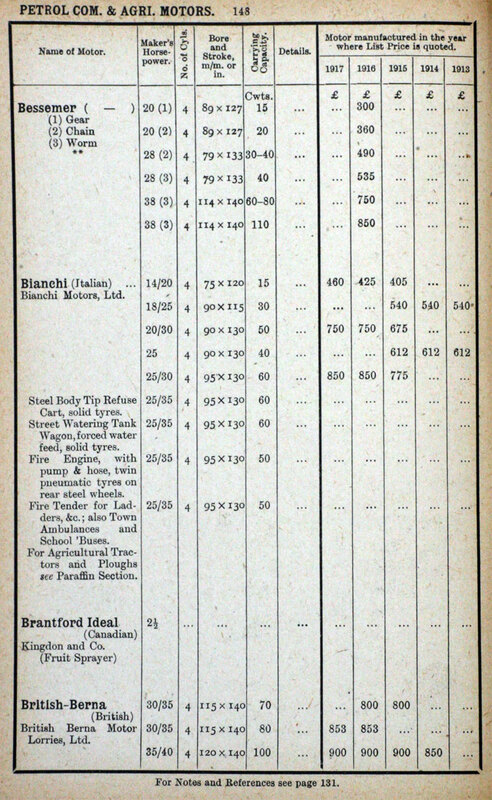 Bessemer, Bianchi, Brantford Ideal (Canadian), British-Berna. p149. 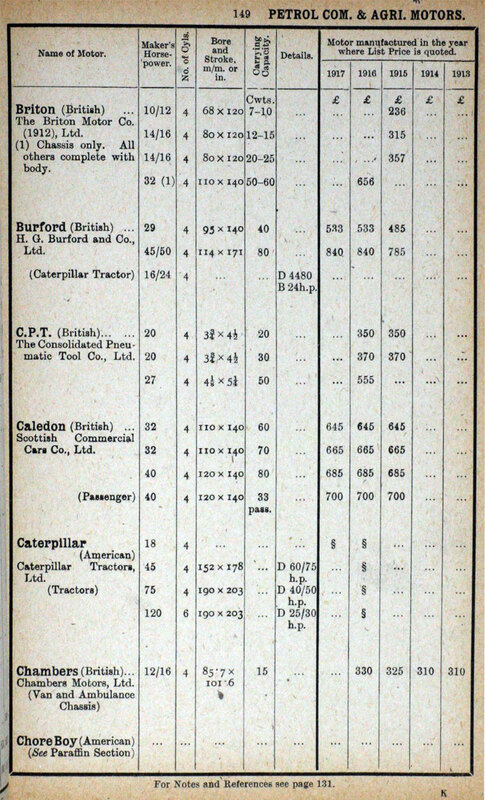 Briton, Burford, C. P. T., Caterpillar (American), Chambers, Chore Boy (American). 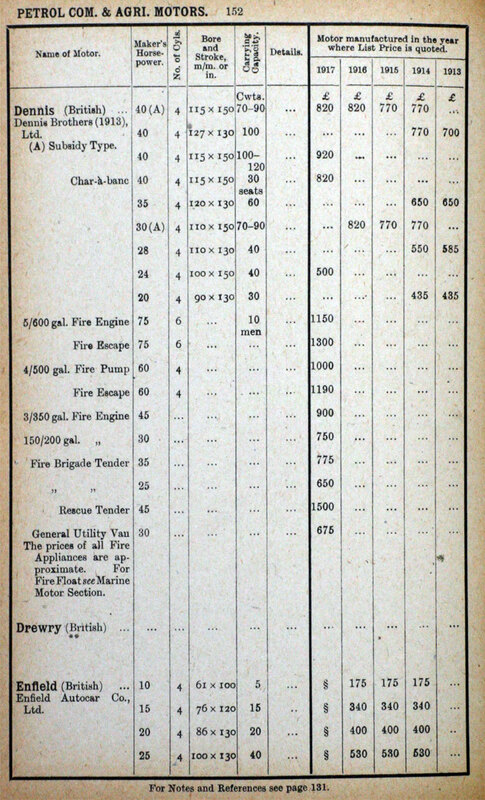 p150. 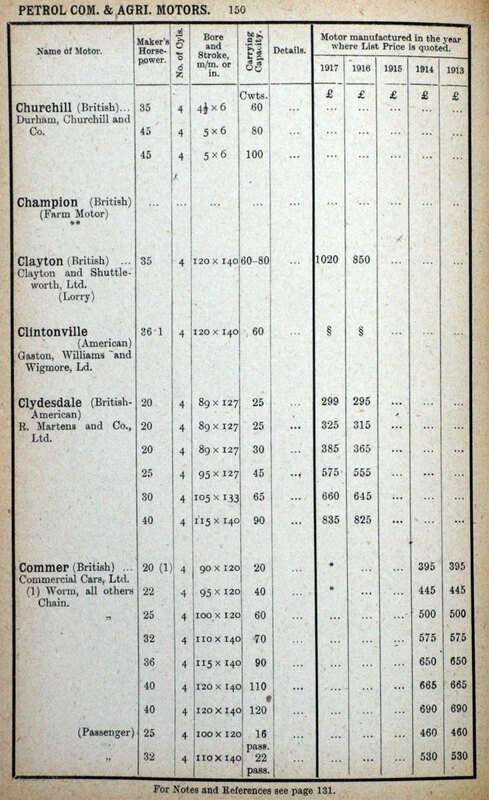 Churchill, Champion, Clintonville (American), Clydesdale (American), Commer. p151. Commer (cont. 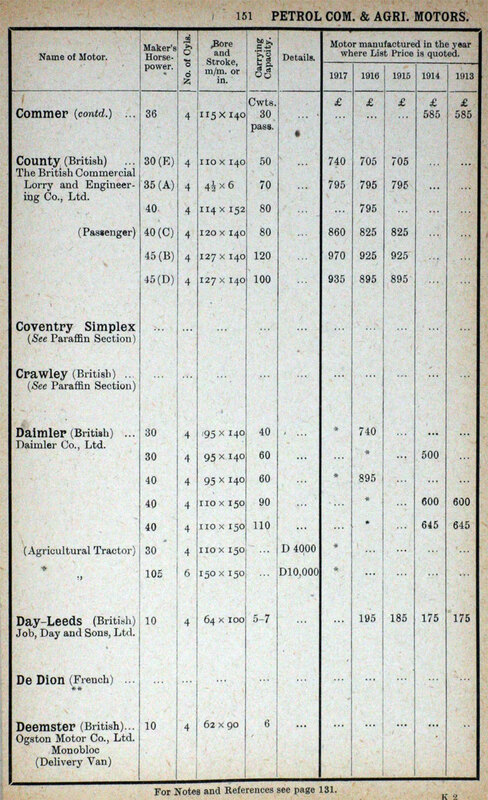 ), County, Coventry Simplex, Crawley, Daimler, Day-Leeds, De Dion, Deemster. p153. Enfield (cont. 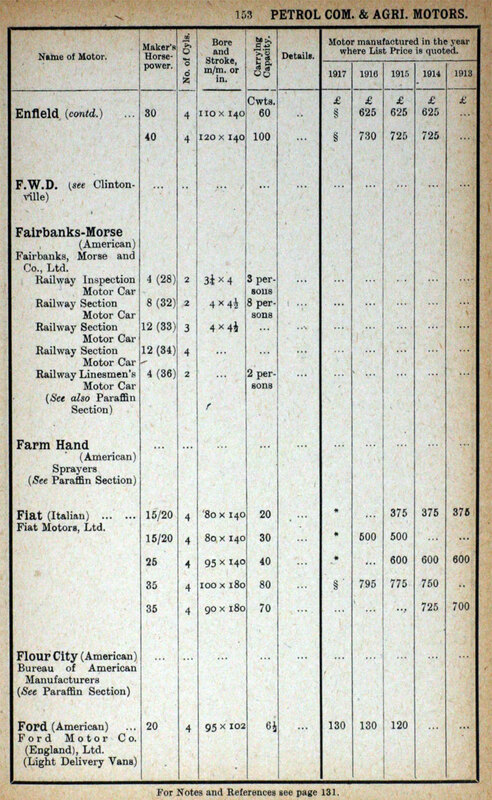 ), F. W. D., Fairbanks-Morse (American), Farm Hand (American), FIAT, Flour City, Ford (American). p154. 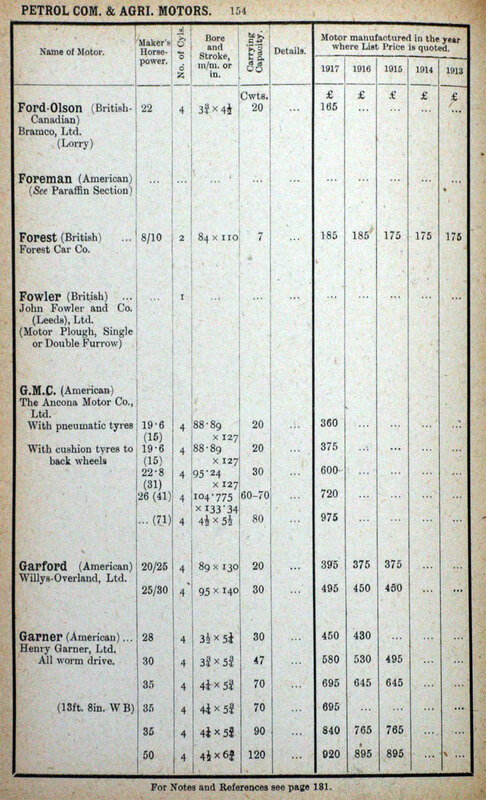 Ford-Olsen (British-Canadian), Foreman (American), Forest, Fowler, G. M. C. (American), Garford (American), Garner (American). p155. 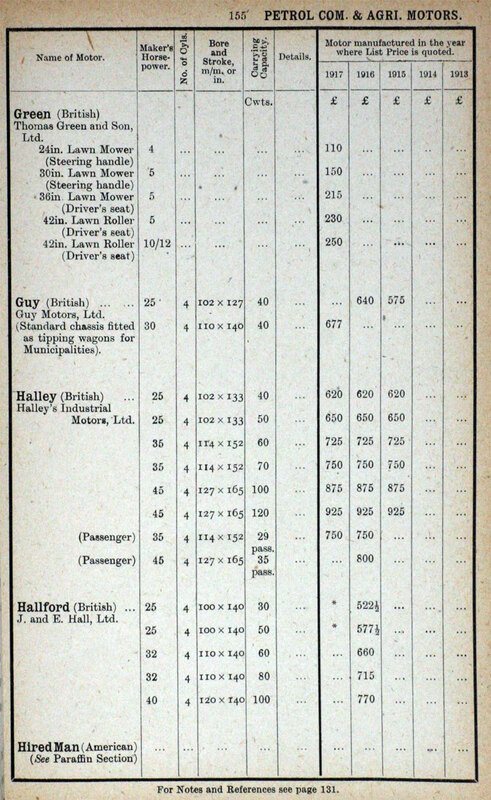 Green, Guy, Halley, Hallford, Hired Man (American). p156. 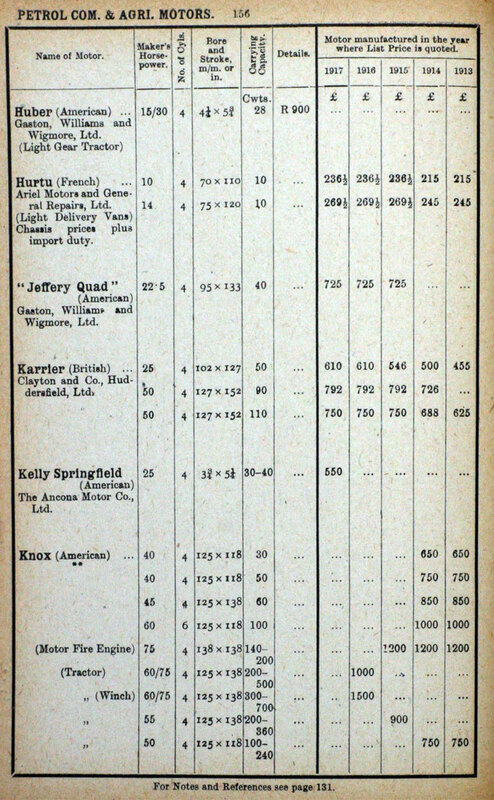 Huber (American), Hurtu, Jeffrey Quad (American), Karrier, Kelly Springfield (American), Knox. p157. 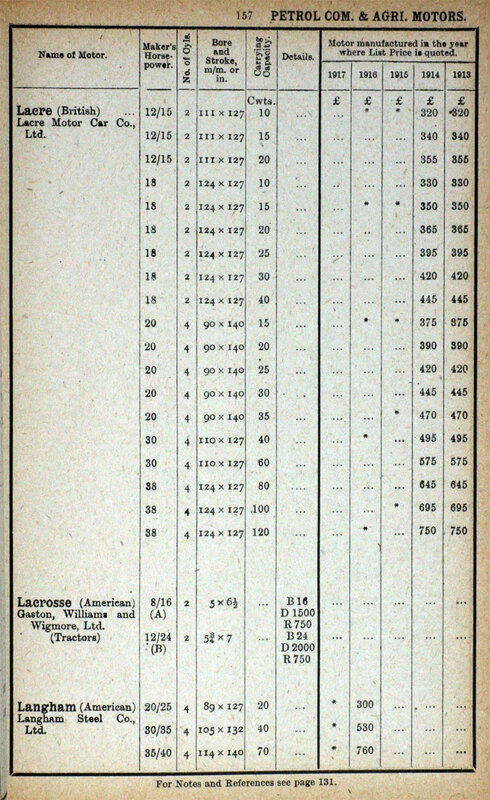 Lacre, Lacrosse (American), Langham (American). p159. 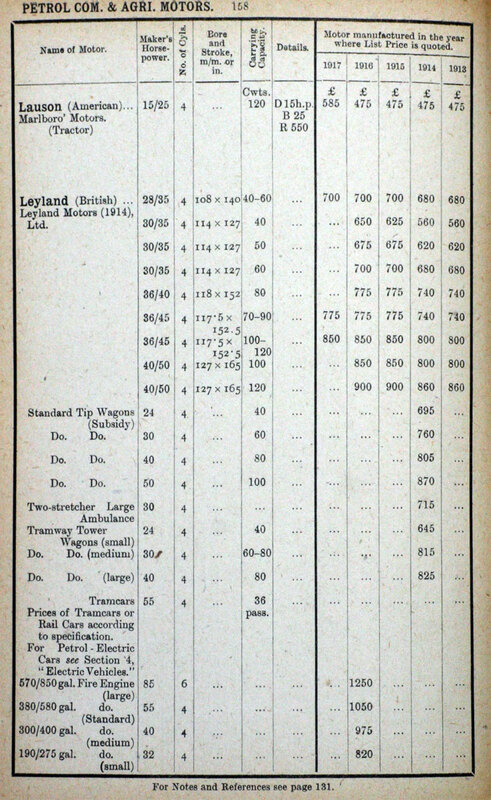 Leyland (cont. 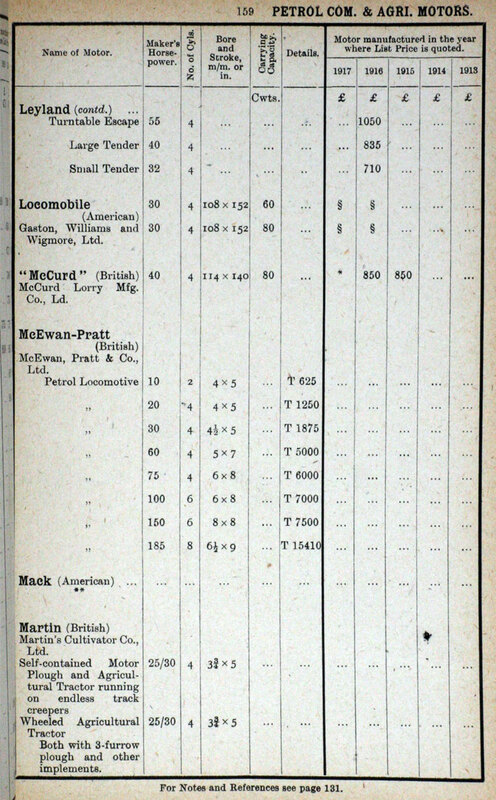 ), Locomobile (American), McCurd, McEwan-Pratt, Mack (American), Martin. p160. 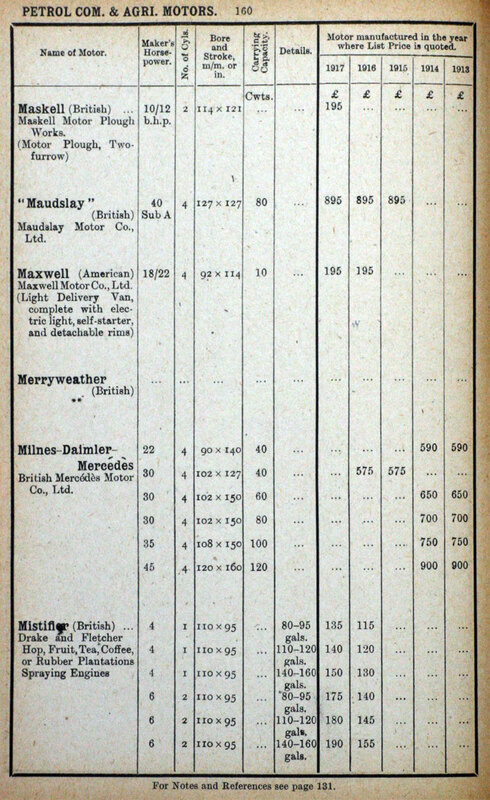 Maskell, Maudslay, Maxwell (American), Merryweather, Milnes-Daimler-Mercedes, Mistifier. p161. 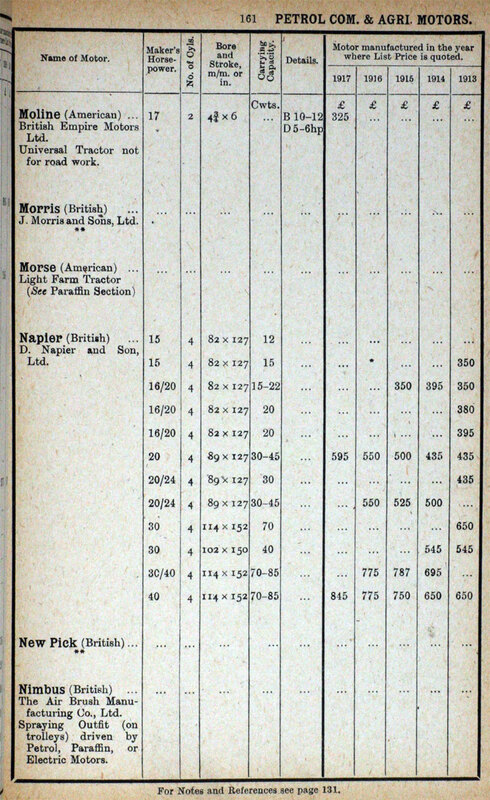 Moline (American), Morris, Morse (American), Napier, New Pick, Nimbus. p162. 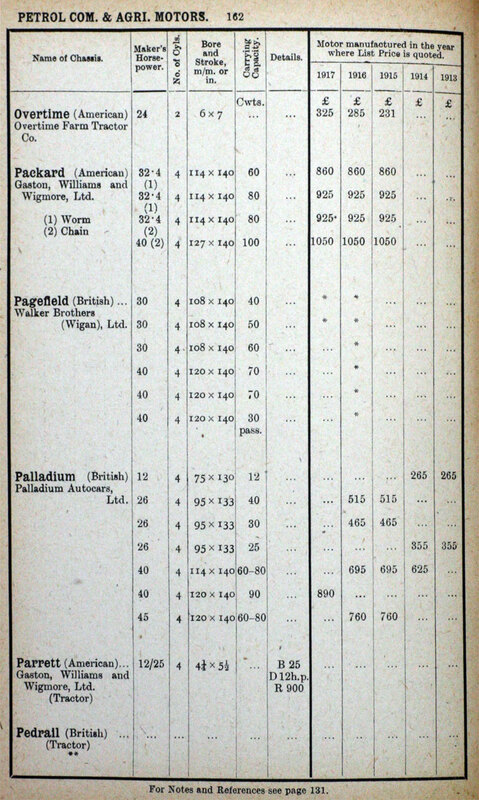 Overtime (American), Packard (American), Pagefield, Palladium, Parrett (American), Pedrail. p163. 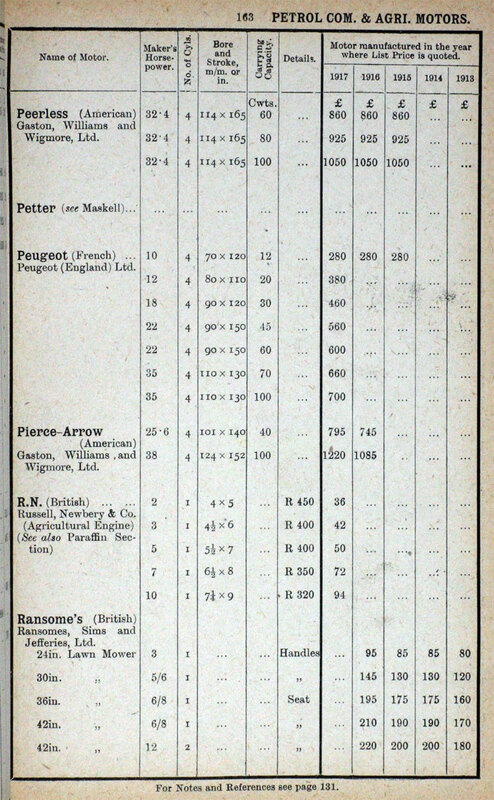 Peerless (American), Petters (see Maskell), Peugeot, Pierce-Arrow (American), R. N., Ransome's. p164. 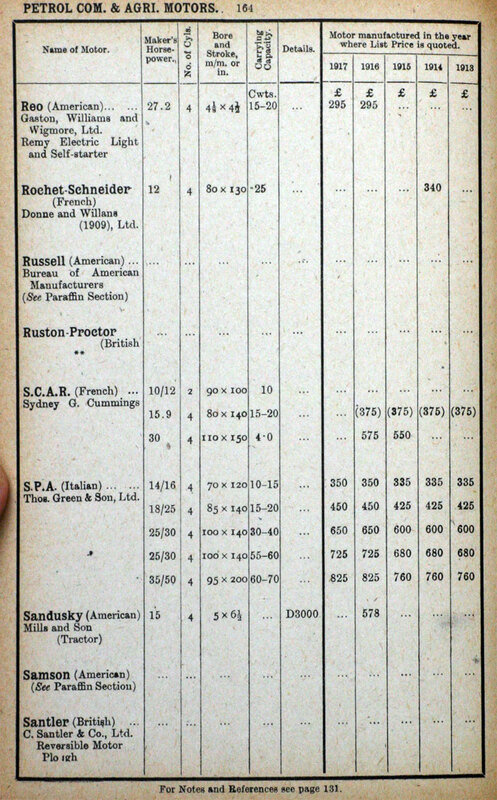 Reo (American), Rochet-Schneider, Russell (American), Ruston-Proctor, S. C. A. R. (French), S. P. A. (Italian), Sandusky, Samson (American), Santler. p165. 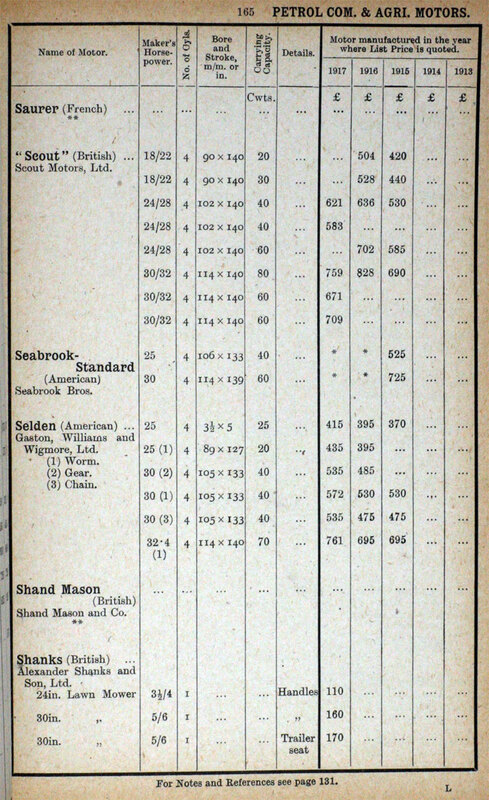 Saurer, Seabrook-Standard, Selden (American), Shand Mason, Shanks. 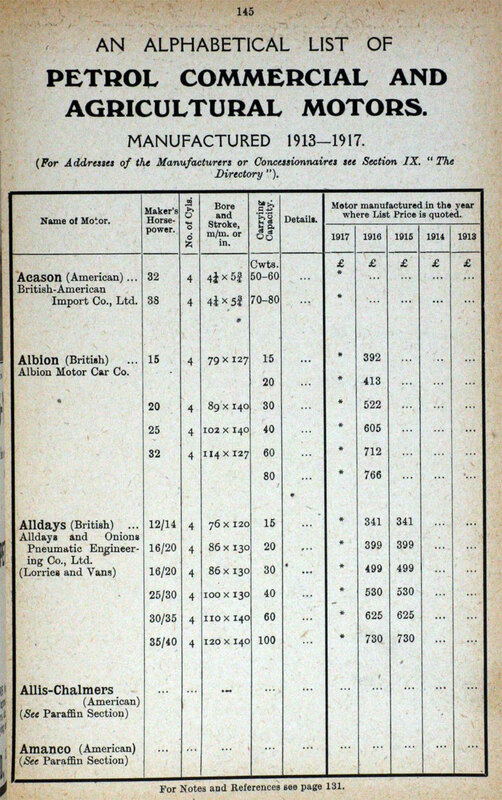 p166. Shanks (cont. 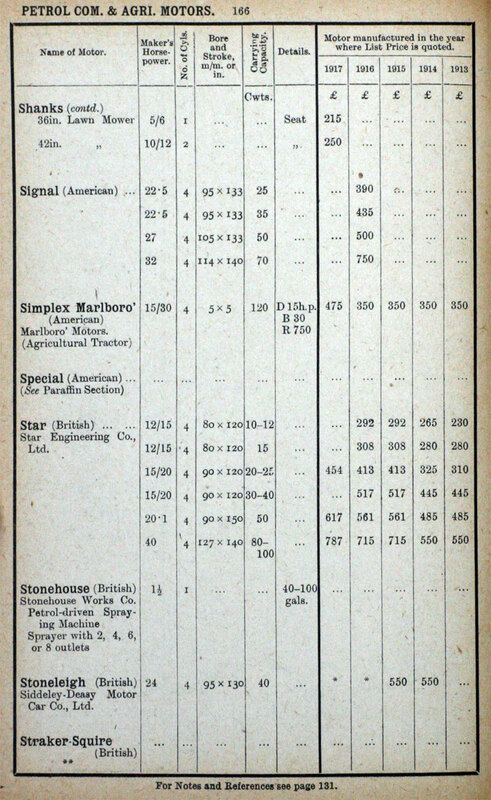 ), Signal (American), Simplex Marlboro (American), Special (American), Star, Stonehouse, Stoneleigh, Straker-Squire. p167. 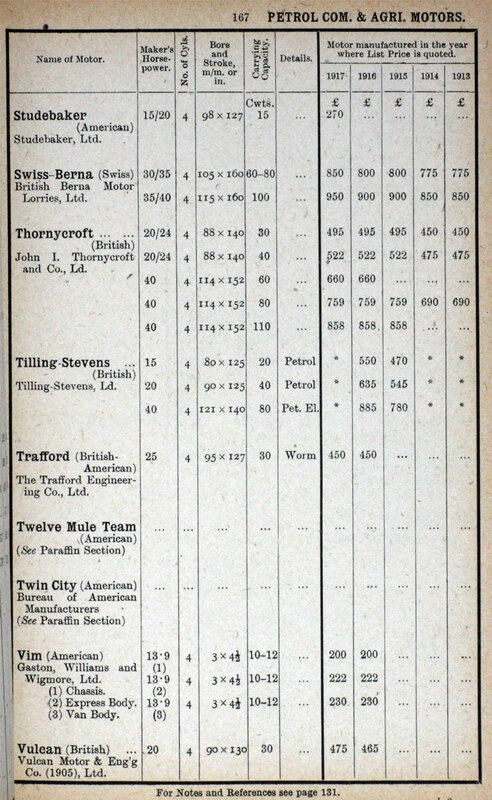 Studebaker (American), Swiss Berna, Thornycroft, Tilling-Stevens, Trafford, Twelve Mule Team (American), Vim (American), Vulcan. p168. Wall, Wallis (American), Wallis Junior (American), Warrick, Weeks-Dungey, White (American), Whiting-Denby (American), Whiting Hall (American). p169. 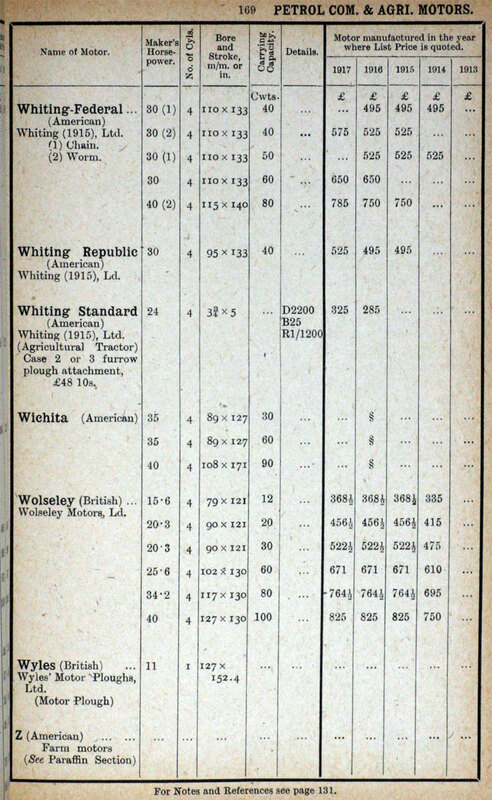 Whiting Federal (American), Whiting-Republic (American), Whiting-Standard, Wichita (American), Wolseley, Wyles, Z. (American).